Brandon G. Green and Lewis Wheeler in “Nat Turner in Jerusalem.” Photo: Nile Scott Shots. ROXBURY – A forlorn soul is handcuffed and shackled, straining to see the last rays of what will be his final sunset in the small town Jerusalem, Va. before he meets his Maker the next morning. The gallows are beckoning. They will come from near and far to see Nat Turner hanged the next morning for leading a slave uprising in Southampton County, Va. that killed 55 whites in 1831. Turner’s motives have been discussed and dissected most notably in Thomas Ruffin Gray’s 1831 pamphlet “The Confessions of Nat Turner, the Leader of the Late Insurrection in Southampton, Va.,” and later in William Stryon’s controversial 1967 novel “The Confessions of Nat Turner.” There have been other books, poems, and essays with often conflicting points of view. 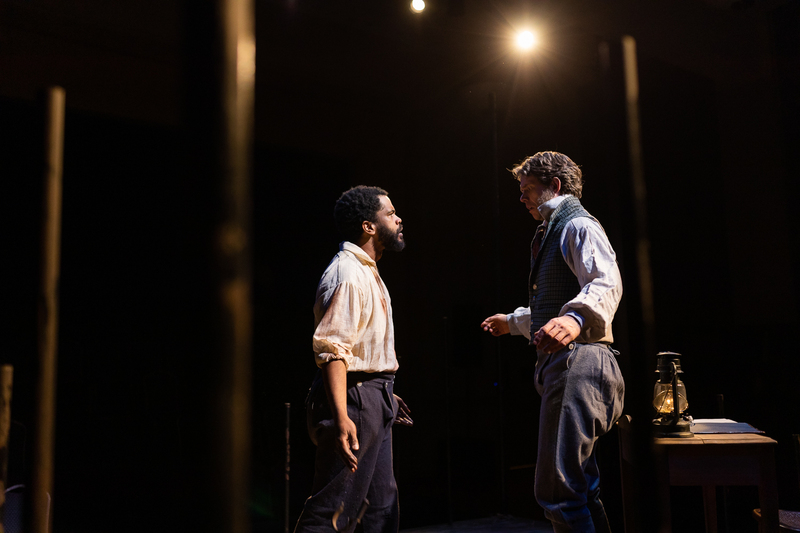 The ASP’s occasional ventures outside of the The Bard’s canon of work have been largely successful and “Nat Turner” is being smartly staged in Hibernian Hall, which has emerged as the cultural hub of the Dudley Square neighborhood of Roxbury. Set designer Janie Howland puts the audience on all four sides of the hall and at the center is a jail cell, dark and foreboding, in which a shackled Turner sits quietly as the audience files in. Lewis Wheeler has been a mainstay on Greater Boston stages portrays for many years and here he shines in two very disparate characters– a poor prison guard who befriends Turner and the aforementioned Thomas Ruffin Gray, the Southampton County lawyer who had taken down Turner’s confession, presented it at his trial and secured a “copyright” for his story on Nov. 10, 1831, the day before Turner was hanged and the same day that the play takes place. “Nat Turner” has a mystical, spiritual feel about it. Turner was a self-styled lay preacher; that showed itself in part to the confessions’ accounts of holy visions. In this telling, Davis is focused on Turner – who could read and write at a time when very few slaves and not that many whites could — as a Christian and a martyr; the killings were not his doing, but the vengeance of The Lord. Rather than run from his crimes, Turner embraces them, putting them in spiritual terms about the inevitability of justice being served, with himself as the instrument of that justice. When Gray reveals he is an agnostic, it adds another layer of conflict and tension to their back-and-forths. It becomes a cat-and-mouse game. Gray wants what Nat has – the last thing of value he has or will ever have – and time is running out on getting it. Gray’s mission: To get to the heart of why Nat did it and information on any plot that had yet to surface. Gray notes that he and Nat are of the same age, and that both families had worked the rich farmland in the area. Gray’s eventual account is not just about the plot; he delves into Turner’s earlier years as a slave. Nat is willing to talk, but it must be done on his terms. “You must swear you will believe me,” he says. He knows full well that what he tells Gray may be rewritten or simply deleted. Wheeler will move smoothly between the two characters, who obviously engage Turner at different levels. As proof of his loyalty to the prisoner, the guard reveals that he refused to take a $100 bribe to let the mob have at Nat before he could be hanged.. The estimable director Benny Sato Ambush is at the helm of “Nat Turner,” and he has asked both Green and Wheeler to get down deep inside their characters in the battle of wills over Nat’s true motives in leading the revolt, and whether others would follow in his wake. Turner knew the importance of what he told Gray, and the impact his words would have then …. and now. And for the whites in Virginia, there came a sense of uneasiness, a chill wind that would continue to blow until Abraham Lincoln knocked down the house of slavery. 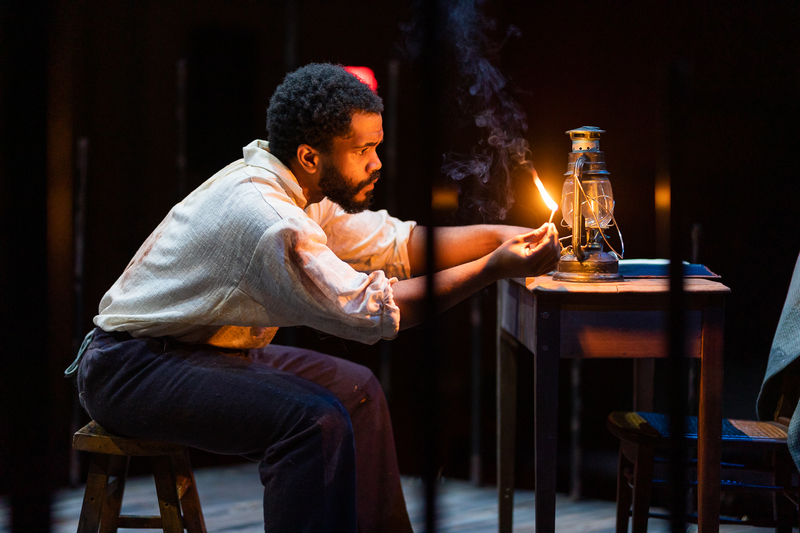 As the observation of Black History Month continues, “Nat Turner in Jerusalem” is an engrossing, well-performed and directed addition to the cultural calendar.